Nothing in the House: Fried Apple Pies with Salted Caramel Glaze on Design Sponge! Fried Apple Pies with Salted Caramel Glaze on Design Sponge! Last month Elizabeth and I were *thrilled* to have an illustrated recipe featured on Design Sponge! The recipe, for Fried Apple Pies with Salted Caramel Glaze is the also the October recipe in our PIE. A Hand Drawn Almanac (Still available on Etsy and in various DC shops!). Elizabeth did these awesome additional illustrations specifically for the piece. They detail the recipe, and can be embiggened by clicking on them. You can also follow the written recipe below for these treats, which is a decadent amalgamation of the Nothing-in-the-House Apple Pie with Salted Caramel Glaze and Apple Fried Pies. 1. Add flour, sugar, and salt in the bowl of a food processor. Pulse to mix. Add the shortening and cut into the flour mixture by pulsing the food processor until mixture becomes the consistency of cornmeal and peas. 2. 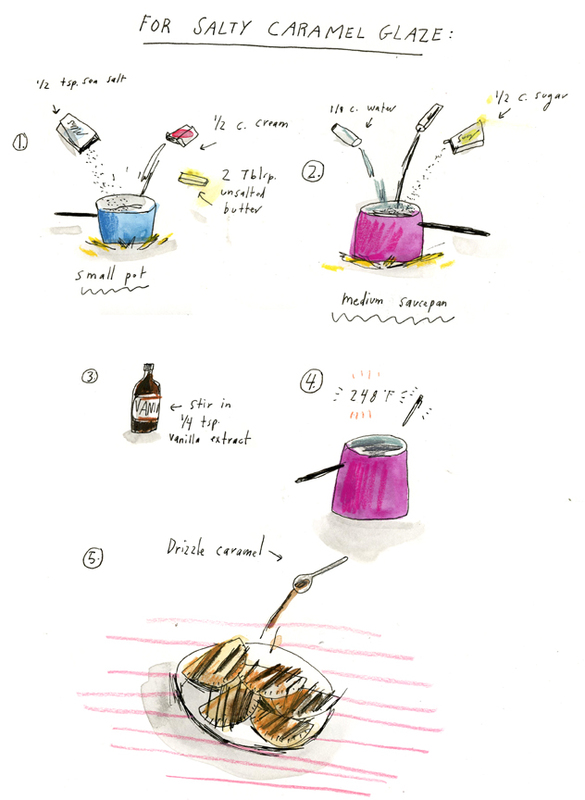 Meanwhile, in a small bowl, whisk together egg and 6 Tblsp. of cold water. Slowly drizzle half of the liquid mixture into the food processor, pulsing to combine with flour. Slowly drizzle in the rest of the liquid, stopping when the dough starts to form large clumps. 3. Once the dough is able to come together, form into a ball and remove from the food processor. Wrap in plastic wrap and let it chill in the fridge for at least one hour. 1. In a large bowl, mix the apples and lemon juice and set aside. 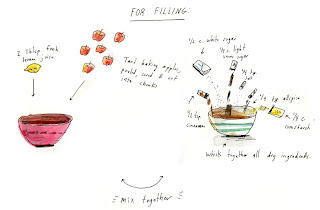 In a medium bowl, whisk together the dry ingredients and add to the apples. Mix together with a wooden spoon until the apples are well-coated. 1. 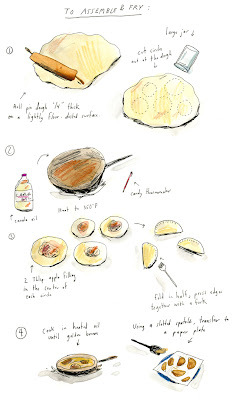 Here you make make the glaze (directions below), or chose to make it after the pies are fried. Remove pie dough from the fridge and roll out onto a lightly flour-dusted surface about 1/4 inch thick. Using a 5-5 1/2 in circle cutter (I used the top of a large jar), cut circles out of the dough. 2. Before completely assembling all the pies, pour at least 2 cups of canola oil (or 4 inches deep) into a deep and heavy saucepan. 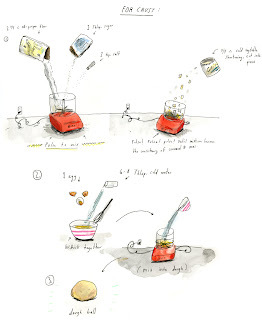 Insert a candy thermometer into the oil. Slowly heat on medium-low until the temperature reads 350 degrees F.
3. Place about 2 Tblsp. of the apple filling in the center of each circle (It is better to under-stuff than over-stuff). Moisten the edge of the pastry circle with your finger, then fold over the dough to form a half moon shape. Press the edges together and flute with a fork to seal completely. 4. At this point your oil should be hot enough to fry. When the oil temperature reaches 350 degrees, gently lower one pie at a time into the heated oil and cook until golden brown (about 2 minutes per side). Using a slotted spatula, transfer to a paper-towel lined plate. Repeat with the remaining pies. 5. When all pies are fried, let them cool slightly while you make the glaze (You could also chose to do this before you start frying the pies). 1. In a small pot, bring cream, butter, and sea salt to a simmer over low heat, making sure to not let it boil. Once it begins to simmer, remove from heat and set aside. 4. Return the saucepan to the stove and cook over medium heat until it reaches a temperature of 248 degrees (you’ll need a candy thermometer for this), approximately 10 minutes. Once it reaches 248, remove from heat and let cool just slightly. 5. 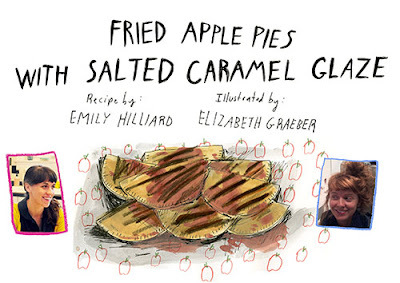 When your pies are fried„ use a spoon to drizzle caramel glaze over one side. Let cool until the caramel begins to harden and serve while pies are warm.